This leg rest is Ideal for those who spend long periods of time seated. This lightweight leg rest positions the legs in a slight bent position which helps to alleviate back and knee discomfort. The knees can be placed in a bent or extended position depending on the position of the rest. 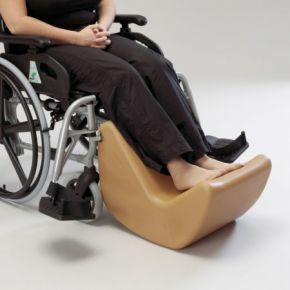 As a footrest, it is a comfortable way for readjusting the seating position of the user to reduce the risk of pressure sores and possible back pain. The surface is made from a soft, durable plastic that can be adjusted for firmness by releasing air from the air valve. Can be cleaned with a damp cloth.